Need a quick dessert this holiday season? 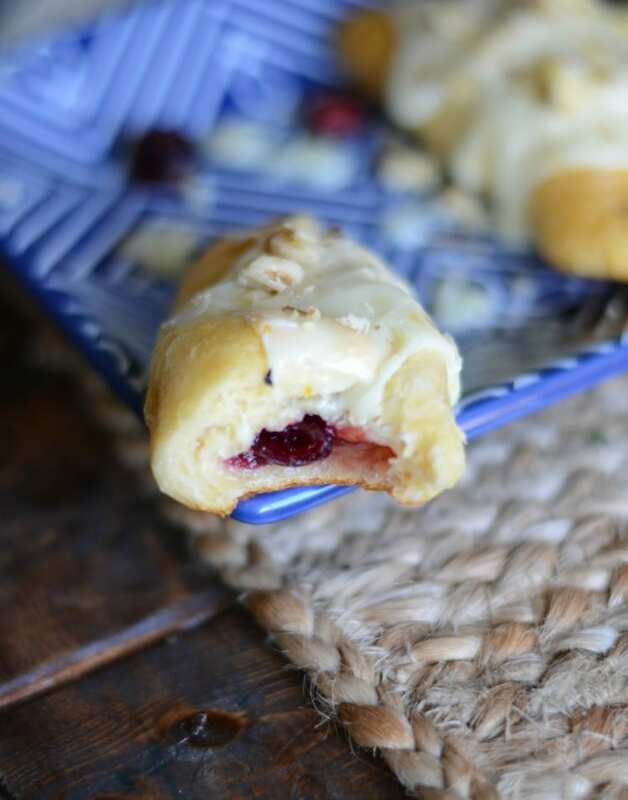 Try these cranberry orange crescents! Hey yall! Ohhh how I love the start of fall! It is FINALLY starting to cool down in the mornings and evenings around here. We even had one morning were the kids had to wear coats to school! Gasp. It was a balmy 58 degrees and lasted about 15 minutes. But we enjoyed every second of it! The evenings are nice too. The cooler weather has almost killed off all the mosquitos and other bugs. It’s been nice to sit outside and watch the kids and dogs play after dinner. We are really enjoying this fall season so far. And one thing that has added to our enjoyment is having Ryder around. Everything is a first for him and the older kids love watching him smile or laugh or find his hands. It’s also a first for us – first time having a birthday as a mom of three, first time trick-or-treating with two kiddos and a baby. There are a lot of first going on this fall. And I CAN NOT WAIT for Ryder’s first Christmas! I know he will not remember it when he’s older but just having him there to love on will be awesome. My favorite things about the holidays are spending time with my family and cooking. My birthday, Halloween, Thanksgiving and Christmas are all times of the year that I get to spend all day in the kitchen. If I’m lucky, I get to share the kitchen with my mom. I love, love, love making a big meal for everyone while chatting it up with my momma. This year, I have a baby helping us. And by help I mean he naps in the ring sling while I try to be as quick as possible. I have become pretty good at 30 minute or less meals the past few months. And the holidays will be no different. I am going to need things to be quick and easy. 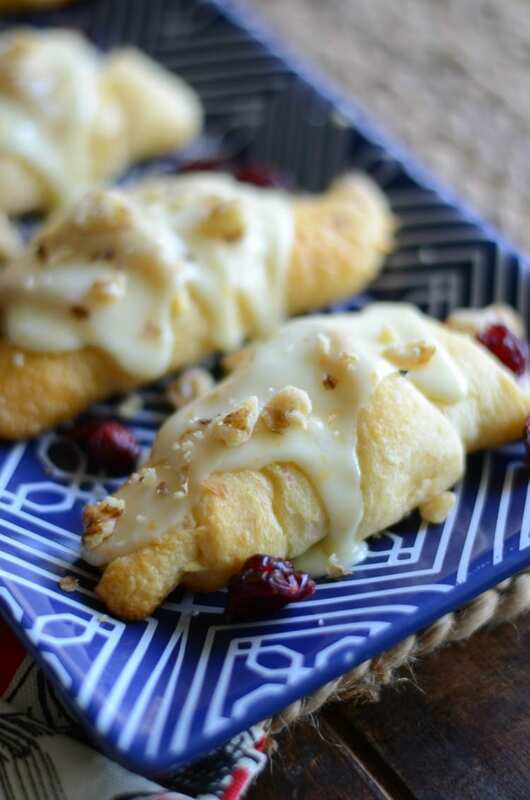 Things like these cranberry orange crescents fit into that category! They also fit into the “oh my gosh they are SO GOOD” category as well. Just saying! 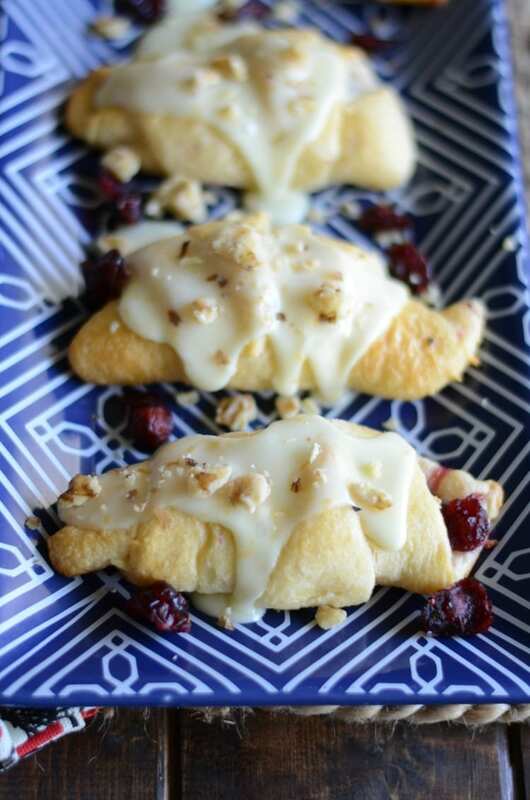 Roll out the crescents onto a silicone baking sheet lined cookie sheet. 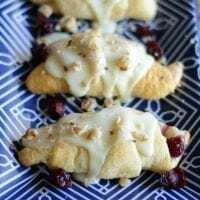 Add a tablespoon of cranberry sauce to each crescent roll. Roll them up as directed and bake for 10-12 minutes. While they are baking mix together the powdered sugar, orange juice, zest and splash of vanilla. Remove the crescents from the oven, allow to cool for 5 minutes and then top with the frosting. Add the crushed walnuts and enjoy! 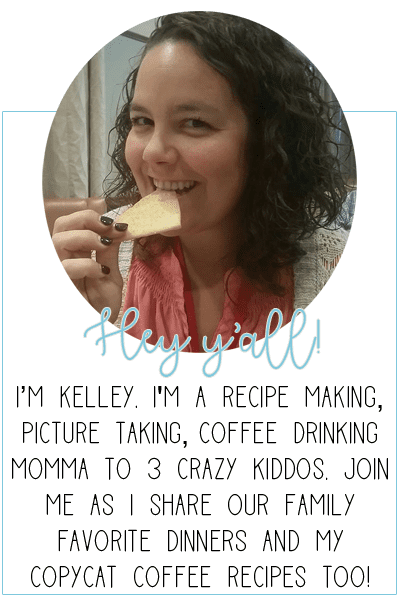 This post contains affiliate links to products I like and have personally used.